MA Ying-Jeou, President of the Republic of China, commonly known as Taiwan, is scheduled to arrive in Haiti Tuesday for a 2-day visit where he will assist in the official inauguration of the new Supreme court of Cassation building that his government help build in Haiti. 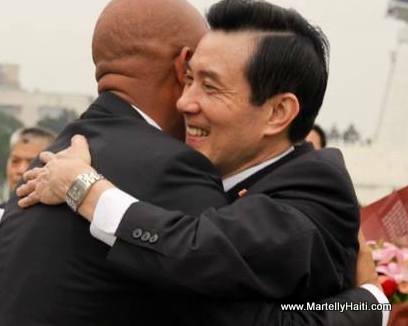 KREYOL: Men Nouvel... Haiti - President Repiblik Chine Taiwan la an Haiti kounye a pou yon visit ki ap dire 2 jou... Nan vizit saa President MA Ying-Jeou ap asiste nan inogirasyon Building Cour de Cassation an... Kisa ou panse de sa? « Haiti Elections - Did Haitian Voters LOOSE Interest in the Elections? In my personal opinion most of friends strangers want the success of Haiti but the practice of the officials claiming to have higher moral standards than other good citizen is wrong, in other word their hypocrisy. In order to reign they take pride in dividing, that's the role of satan, he is against all that intends to do good.The strangers know well and see what's going on in Haiti.